St. Barnabas ministry team members with Bishop Wendell Gibbs. You may notice that we don’t have the name of our rector/pastor/minister on our sign out front. That’s because we don’t have one! Instead, we have a ministry support team. 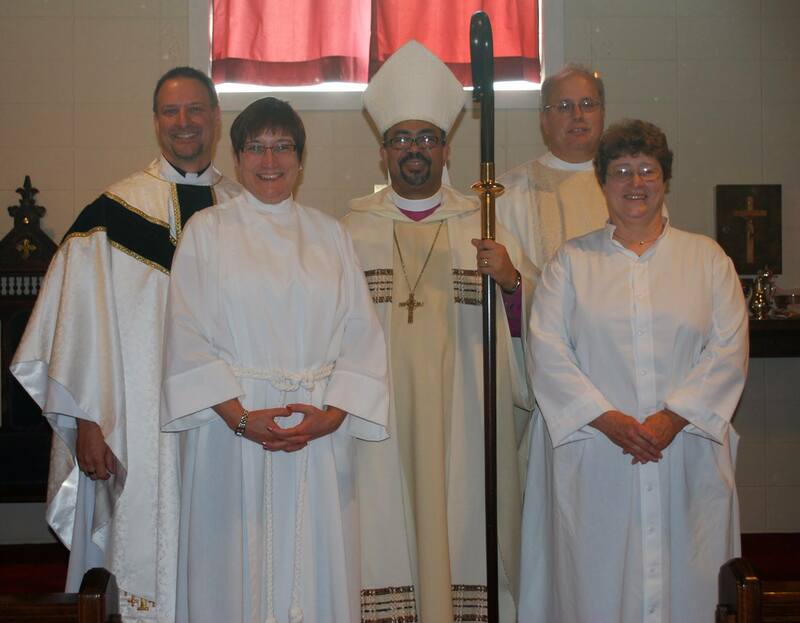 Since 2006, the congregation of St. Barnabas has been led by a ministry support team trained by the Diocese of Michigan, each team member ordained or commissioned in one or more areas of ministry. Each of our ministry support team members is commissioned or ordained for sacramental ministry, preaching, pastoral care, Christian education or administration. Most people are surprised to learn that no one on our ministry support team is paid. All our team members serve on a volunteer basis. Each has been called by God to serve the congregation here at St. Barnabas. And despite the volunteer status of our team, we don’t feel deprived! On the contrary, we are privileged to have a wonderful team with many important gifts and top-notch skills—and a team that has devoted so much of their lives to our lives. They keep us hopping. And thinking, and praying, and singing, and giving. Commissioned for Christian education and administration 20 Nov 2010 I was commissioned for Christian education and administration on November 20, 2010, along with the rest of the second-generation ministry support team. I am married and have one son, and have lived in Chelsea for 20 years. After the horrific events of 9/11, I felt compelled to return to church. I’ve always been an organizer and scheduler. I work at the Common Grill as a baker. What I enjoy most about serving God at St. Barnabas is watching the congregation members grow into their faith. Understanding that God is an everyday part of their lives—not just a “Sunday” thing. Intern Member I am Kelly Scheu, the newest member of the ministry support team. I am still in the process of becoming an official member, working with the Ministry Development leader on required classes to complete the “formation” process. I have a wonderful partner named Patty. She is my rock and my best friend. We love spending time together outdoors gardening, fishing, watching Michigan sports, and hiking. I am a Nurse Practitioner at the University of Michigan in Breast Oncology. I am blessed to be able to share my spiritual gift of healing through prayer and human touch. My journey at St. B started when the ministry support team saw my leadership strengths and my gift to share the Word. I have always had the spiritual gift of evangelism but didn’t know quite where to go with it. I started by sharing some “reflections,” and that finally led me to a Lay Preaching certification. My journey continues, and my calling is still being discerned through prayer and guidance from the Lord. I love sharing the spirit-inspired Good News with the people of St. B. The positive feedback received from the congregation reassures me that the words spoken are the Lord’s words—not just my own. Sermons have to come from the Lord to reach the needs of the people, because when they are just our own ideas we can lead people astray. I am truly blessed to be a part of such a loving, inclusive, and giving congregation. Ordained to the priesthood 20 Nov 2010 More on Bill coming soon. Commissioned for pastoral care 11 Jun 2006 More on Jan coming soon.